I have to admit, I am a big kid! So when I got these cookies from Octopus Inc I had fun taking them out of the packet to see what animals were inside before eating them. 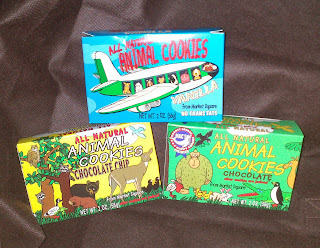 These cookies were just as fun for me as well as for children, especially for lunch boxes or when kids are travelling. Each flavour has a colourfully designed boxed with a theme on it. It comes in four flavours: Vanilla, Chocolate, Chocolate chip and Cinnamon grahams. All the cookies tasted natural and did not have any weird aftertaste nor were they oily. My favourite flavours were the Chocolate and Vanilla which brought back memories as a kid and the biscuits back then because of the taste.